Joseph Franklin "Joe" Niekro (November 7, 1944 – October 27, 2006) was an American Major League Baseball right-handed pitcher. He was the younger brother of pitcher Phil Niekro, and the father of Minor League Baseball pitcher and first baseman Lance Niekro. Born and grew up in Martins Ferry, Ohio, Niekro attended Bridgeport High School in Bridgeport, Ohio and attended West Liberty University in West Liberty, West Virginia. During a 22-year baseball career, he pitched from 1967–1988 for seven different teams, primarily for the Houston Astros. Niekro pitched for the Chicago Cubs, San Diego Padres and Detroit Tigers with occasional success before joining Phil with the Atlanta Braves in 1973. Joe used a fastball and a slider early in his career, with mixed results. He spent two seasons in Atlanta with Phil and got re-acquainted with the knuckleball that their father taught them. The knuckleball became an essential part of his arsenal though never his sole pitch. Joe threw harder than Phil and could set up batters nearly as effectively with his fastball in combination with his excellent changeup. The Houston Astros purchased Niekro's contract from the Braves for $35,000 in 1975. He blossomed into a dominant pitcher as he perfected his knuckleball in Houston, going 21–11 in 1979 and 20–12 in 1980, to become the first Astros pitcher to win 20 games in consecutive seasons. He also made the National League All-Star team in 1979, a season in which he led the league with his 21 wins and five shutouts, won the TSN Pitcher of the Year Award, and ended second in voting for the Cy Young Award behind Bruce Sutter. 1979 also saw the Niekro brothers tie for the wins leader in Major League Baseball, marking this the only year that two brothers shared this honor. In 1980, Houston had a three-game lead over the Los Angeles Dodgers in the NL West, then lost their last three games of the regular season in Los Angeles, to force a one-game playoff. 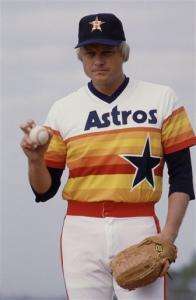 Niekro allowed six hits in a 7–1 Houston victory that propelled the Astros to their first postseason. He then pitched 10 shutout innings in Game 3 of the NLCS and the Astros won, 1–0, though they lost the series to the Philadelphia Phillies, 3–2. In September 1985, Houston traded the 40-year-old Niekro to the New York Yankees, where he briefly reunited again with Phil. Niekro finished his career with the Minnesota Twins, where he pitched in the World Series for the only time, in 1987. Earlier that season, Niekro had been suspended for ten games when umpire Tim Tschida discovered a nail file in his pocket during a game against the California Angels. When Tschida told Niekro to empty his pockets, Niekro reached into his pockets, pulled out his hands and threw them in the air. The emery board and a piece of sandpaper flew out of his pocket and fluttered to the ground. The video of this made a lot of sports-highlight shows and is a common "blooper" clip today. Niekro said he was filing his nails in the dugout, but American League president Dr. Bobby Brown did not believe him, and ordered the suspension. Niekro was eventually released by the Twins shortly into the second month of the 1988 season and subsequently retired. On October 26, 2006, Niekro suffered a brain aneurysm and was taken to South Florida Baptist Hospital in Plant City, Florida. He was later transferred to St. Joseph's Hospital in Tampa, Florida, where he died the following day at age 61. The Joe Niekro Foundation, created by his daughter Natalie, is committed to supporting patients and families, research, treatment and awareness of Brain Aneurysms, AVMs and Hemorrhagic Strokes. The non-profit organization provides education on the risk factors, causes and treatments of these conditions, while funding the advancement of neurological research. His 221 career wins make him one of the most successful knuckleball pitchers of all time. The Niekro brothers combined for 539 total wins, making them the most successful brother combination of pitchers in major league history (at least by wins). On May 29, 1976, Niekro hit the only big league home run of his career (973 lifetime at bats), and it came off his brother Phil. In the 1987 World Series with Minnesota, Niekro set a record for the longest period of time between a major league debut and a first appearance in the Series. He appeared on Late Night with David Letterman on August 15, 1987, wearing a carpenter's apron and carrying a power sander, while serving a suspension for having a nail file on the mound. The Minnesota Twins released a bobblehead set of the 1987 World Series team; Niekro's included a nail file in his back pocket. ↑ "Yankees acquire Niekro." Lewiston Daily Sun. 1985 Sept 16. ↑ "SPORTS PEOPLE; Suspended Animation". New York Times. August 16, 1987. Retrieved October 28, 2006.
thebaseballpage.com articles and stats about Joe Niekro including Joe Niekro's Improbable Year by Jeff Katz.